It’s taken me a day to recover, but once again we had a splendid time at the State Fair! We walked, walked, walked – did a lot of people watching and even did a little fish watching. It was entertaining to see so many folks in thrall at the “Fish of Minnesota” pond, just staring at fish. I let the kids loose with $10 each, they cleverly pooled their resources to purchase 50 tickets (11 more than they could have bought separately) and thus we learn the lesson of collective bargaining. They ate and rode until they should have been sick (but weren’t) and they they ate some more. We visited the Miracle of Birth pavilion (my favorite, I love to see how many pregnant women gather there) and watched the adorable piglets, lambs and calves becoming acquainted with the world. The kids got their fill of the bottomless milk cup (all you can drink for $1) and Gerry had the clever idea of asking them to mix chocolate and white. Perfect harmony, in a cup. As we were leaving – me, hobbling on my exhausted feet and ankles – we took a stroll through the creative arts building to look at the creative arts. I was surprised at some of the blue ribbon winners (there’s probably always some disagreement with the judges) and really felt that the best stuff had red, pink and white ribbons. Just one knitters opinion. I love the jellies and food awards, they look so pretty in their random arrangement of color. 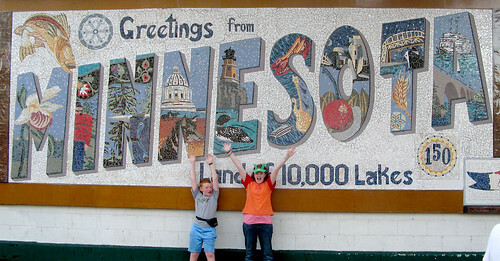 Finally we all piled in the car and drove home – exhausted, happy and feeling a little more Minnesotan every day. If you’re interested, I’ve posted my latest newsletter, which will be going out today. I didn’t do a newsletter in late July, my Summer off. Check it out here, and sign up for the monthly heads up on my latest shenanigans. BikeToday Hannah and I did a dry run on our bikes to her Jr. High school, she’s been feeling a bit uncertain about biking all the way. I think she really needed the ride to feel comfortable on her bike (we just got it back from the shop yesterday) and I’m hopeful she’ll enjoy the ride as much as I do. And, there’s always the bus if she doesn’t want to ride.